Birth Anniversary of Baba Buddhanath Das: 10-Jan, 2016. 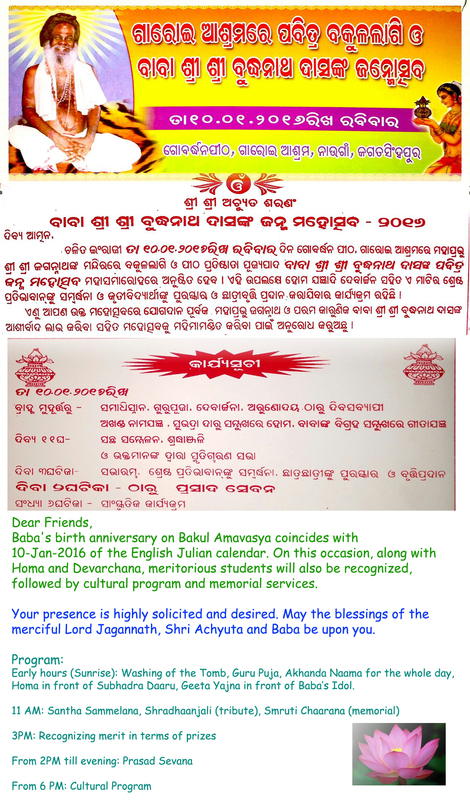 Link to (~2.3 mb, jpg) invitation and program details, information added on 4-Jan-2016. 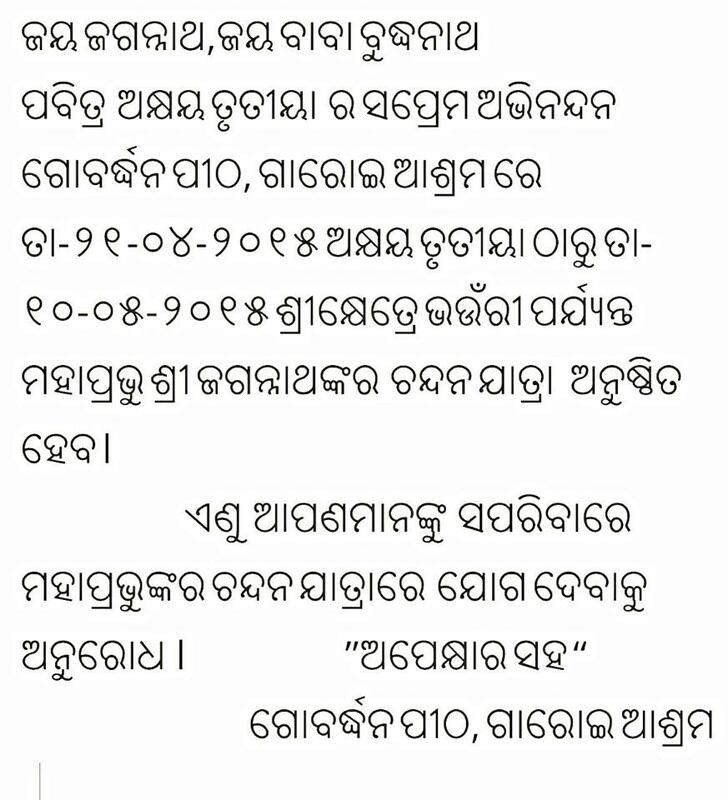 Nemala Yajna 2015: as hinted in Malika (ମାଳିକା), Nemala Yajna will be performed near the Samadhi Pitha (Tomb) of Shri Achyuta, between 28-Apr and 4-May, 2015. Dear Devotees and Believers, please consider yourself to have been informed. ++Details of Nemala Yajna, information added on 19-Apr-2015. A much awaited Yajna, as was written in Malika, was performed at Maa Biraja Khsetra in Jajpur in June 2014. We will attempt to add some details later. However, a glimpse of this Yajna can be viewed from the mini-video on Youtube and some Photos of the event are available from Jajpur Yajna Album at Pinterest. Baba Shri Buddhanath Das's birth anniversary was on 01-Jan-2014 on the day of Bakul Amavasya (lunar calender). Malika varnita (as described in Maalika by Sri Achyuta ~550 years ago) Yajna at Khandagiri hills was performed in front of Maa Barabhuja Durga in May 2012. ++Details' page. Some Photos of the event are also available from Khandagiri Yajna Album at Pinterest. Baba's Birthday, which is on the Bakul Amavasya (lunar calender) falls on the 4-Jan-2011. Although after the Gaya Shraadhha, it has not been observed as colorfully as before, Baba has instructed Mata (in vision) to make ArnaDaana (offer food) to people of nearby villages. Accordingly, it will be performed in Garoi and all the nearby villagers have been invited to come to Ashram on that day and have food. Devotees, like on any other day, may also remember Baba, staying far or near. One incense stick with Shradhaa (fondness and faith), and a few minutes of your time, is enough- as Baba always used to say. Jobra Ghat Yagna, 22-May-2010 to 27-May-2010. This is the one, the much-awaited Yagna where Anakaara test will be performed and Shri Achyuta will indirectly reveal himslef via the test. Devotees and believers are urged not to miss this one. 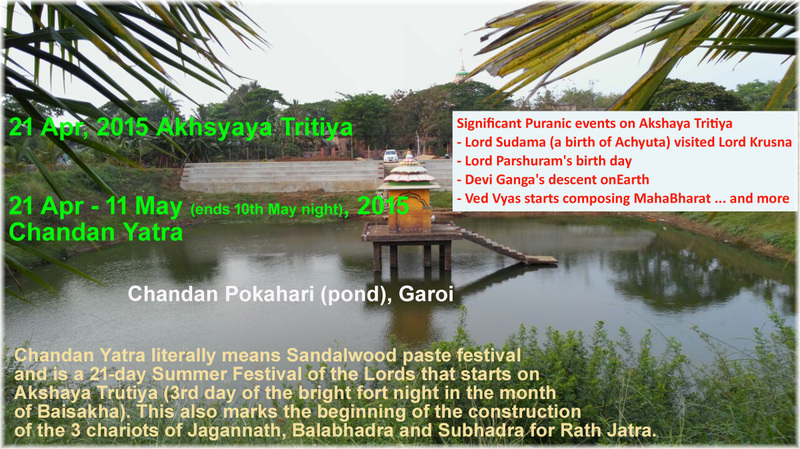 ++Details of this planned Yagna, information added on 8-Mar-2010. Shialidah Karma, West Bengal, India : June end - July beginning, 2007. This was one of the most important and much awaited karma, which was accomplished successfully in June-July, 2007. The mention about this Yagna is made 500 years back in Shri Achyuta's malika, where Saint Arakhsita Das was supposed to take part in his ethereal form and provide his spiritual support and power for the future Yuga Karmas. This Yagna's realization required some support from the locals (temples, priests) of Sialdah, West Bengal and was somewhat difficult to manage. However, with his grace, everything worked out well. Thanks to the 'friends' at Kali Ghat and Sialdah who helped us in sorting out this issue and achieving our planned tasks. Yagna was held at 2 different locations: a) near Kali Temple in Kali Ghat, and 2) in Sialdah as was written in Malika. Along with the purpose of the Yagna, Mother Kali's grace and blessing was also obtained in form of a 'Shakti' (details not elaborated) which was brought back to one of the pitha's (spiritual location) of Shri Achyuta (details omitted). This 'Shakti' will be a protector in the future Karma. This Sialdah Yagna was a sequel to Jobra Yagna, Cuttack, 1995 (see below). Amidst some confusion (or deliberate play of Achyuta), in the final hour it was instructed by Tamrapothi (copper oracle), to perform the Ahuti (offering) in "Water" instead of "Ghee", same as in Jobra Yagna in Cuttack. A specific mantra, obtained from pothi and given by Achyuta, was applied to "Water" to lit the holy Yagna fire. - Strange are Achyuta's ways, where fire burns in water instead of getting extinguished!. Our beloved Baba (Shri Buddhanath Das) left his mortal body last year (Sep,2006) but he had his presence in this Yagna fully. On occasions, he himself answered via the Taamrapothi also (when there were some faults - dosha) and via other medium (we can't disclose more now). A photo of him, which was chosen by him before, was placed near the Yagnasthala (spot of Yagna) as his representative. This game is a combined sport of Guru Achyuta and Shishya Ram Das (Buddhanath Das), both playing from Shunya. They execute there tasks via their devotees, remaining in Shunya and out-of-reach of any human interference, but constantly protecting and blessing their devotees and believers. 1) clip one: water offered to fire 2) clip two: water offered to fire with different view, 3) clip three: in front of mother Kali where a 'shakti' was received. The follow-on to this Yagna will again be in Jobra Ghat (Tatwa bata), Cuttack, when Mahapurusa Achyuta will instruct; the third Yagna will be a sequel to this and the three together will complete the purpose of this particular type of Yagna. - apart from several other ones. Rath yatra at Garoi. The chariots were taken to newly constructed Gundichha temple at Garoi (19 June 2004). The festival was celebrated with the usual norms and ceremonies. Rath yatra at Garoi. The chariots were taken to newly constructed Gundichha temple at Garoi (1 July 2003). In earlier years, the Rath Yatra was celebrated symbolically, but from this year, proper chariots (though small) were constructed and the car-festival was celebrated completely. Jobra Yagna, Cuttack, Orissa, India (1995): The yagna of the five elements. It was one of the rare yagnas, which invoked the power of the five elements and various forms of God, demigods, and Rishi Munis. At the end of the five days Yagna, the area witnessed the power of all the five elements working strongly together with heavy wind, strong shower, and sunlight. As per the instructions of the Oracle (Mahapurusa Achyuta), using a specific mantra, the obligations were given with mantra-energized water from the nearby Mahanadi River instead of clarified butter (ghee). The astonishing fact was witnessed by thousands. The Jobra-yagna marked the beginning and towards the end another major yagna (Anakaara test) will also be performed there, where Shri Achyuta will reveal himself indirectly.